3rd June 1984, the Indian Army invaded the most sacred of all Sikh shrines, Sri Harmandir Sahib (The Golden Temple). The destruction and loss of life marked the darkest chapter in Sikh history this century. This event marked a critical turning point for all Sikhs around the world as it made them realise that they could not take the existence of their religion for granted. Sikhs around the world remember it as their very own 9/11, their worst trauma in modern history. It was an attempt to exterminate so-called “militants”, said the Indian authorities. But the costs were enormous. Thousands of people were killed in and around the temple; many of the dead were innocent bystanders and pilgrims, rather than militants. For the Panjabi-Sikh Nation it was a heinous defilement of their most sacred site and the slaughter of hundreds of innocent pilgrims. 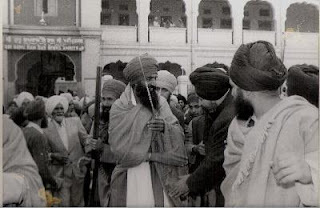 Across Panjab hundreds of Sikhs were murdered in the army operation and 42 other Gurdwara were raided simultaneously as Sri Harmandar Sahib was attacked. Codenamed ‘Operation Bluestar’ was a premeditated, calculated attempt by the ruling far-right congress government to destroy the soul, spirit and confidence of the Sikh race. But the spirit of the Khalsa remains unhindered. 25 million Sikhs around the world, millions of Ardas daily, as we remember those brave men and women who stood against tyranny and died for freedom and justice. Over time Maps are drawn, Nations are born, until then the struggle for self-determination continues.